Only 3 kilometres from Cordoba. This 16th century house once belonged to the family of Luis de Góngora y Argote and was later turned into a working farm, complete with olive oil mill, by the Marquis of Cabriñana del Monte (18th century). Come and discover this authentic country-style hostel steeped in history, nestling in stunning scenery and surrounded by wildlife in the mountains of Cordoba, with unbeatable views of the city, too. 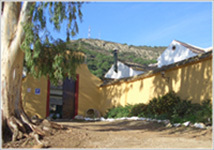 Cortijo Cabriñana is also a Farm School which runs environmental education programmes for children and teenagers of all ages: school visits, end of term trips, summer camps, weekend activities, stays at Christmas and Easter, birthday parties, communion receptions... all offering fun workshops and a range of fascinating activities for the kids. Educational Farm "Cortijo de Frías"
Workshops on agriculture, livestock, ecology, summer courses and many more activities which allow children to come into contact with nature and the world of the countryside.